In the tradition of her bestseller, Finding Your Own North Star, Oprah Magazine columnist Martha Beck reconnects readers with their best destinies. Described as one of the best-known life coaches in America in media such as Psychology Today, NPR, and USA Today, Martha Beck has demonstrated a rare gift for helping people whose lives have gone off course find their way back to authentic, rewarding lives. 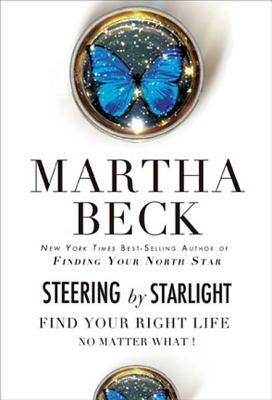 Now, in Steering by Starlight: Find Your Right Life, No Matter What!, Martha Beck describes the step-by-step process she uses with her private clients to help them navigate the terrain of their best lives. Bringing together cutting-edge research in psychiatry, neurology, and related fields in an accessible, substantive, original way, Dr. Beck offers powerful new methods for solving the problems that beset ordinary people. Using her trademark wisdom, empathy, and engaging style, she connects readers with fresh, never-before published strategies that have proven most effective and efficient for the hundreds of people she has coached. For readers who have found their North Stars, this book will be an invaluable tool to stay the course and overcome obstacles. For those who still feel adrift, it will provide a way to find true North and follow the path of best destiny. Whether it's seeking better relationships, more focused career direction, the achievement of specific fitness goals, or a more harmonious lifestyle, Steering by Starlight's colorful anecdotes, case studies, and exercises will point the way. MARTHA BECK, PHD, is a life coach and monthly columnist for O: The Oprah Magazine. She has taught career development at the American Graduate School of International Management and was research assistant to Dr. John Kotter at Harvard Business School. The author of the bestsellers Finding Your Own North Star and the memoir Expecting Adam, and The Four-Day Win, she lives in Phoenix, Arizona.